As one of the cultural capitals of California the city of Carmel inspires this artistically designed line of California Outdoor Concepts fire pit tables that make a simple yet bold statement for your backyard sanctuary. A tapered aluminum leg base sits under the shine of a polished granite top available in Sunset Gold Sea Green Black Mahogany or Pebble. Imagine yourself in a quaint beachside bistro as the soft breeze glances off your skin and draws you and your company closer to the glow of gentle flame shining.Show everyone your cultural affinity with the Carmel Chat Height Fire Pit.Features. Sits 23 in. high. Base Color - Black. Burning Element - Diamond White Glass. Granite Top Finish - Capistrano Mosaic 48 in. Tile Top. Size - 48 in. California Outdoor Concepts 5010-BK-PG11-BM-48 Carmel Chat Height Fire Pit-Black-Copper Reflective Glass-Black Mahogany-48 in. As one of the cultural capitals of California the city of Carmel inspires this artistically designed line of California Outdoor Concepts fire pit tables that make a simple yet bold statement for your backyard sanctuary. A tapered aluminum leg base sits under the shine of a polished granite top available in Sunset Gold Sea Green Black Mahogany or Pebble. Imagine yourself in a quaint beachside bistro as the soft breeze glances off your skin and draws you and your company closer to the glow of gentle flame shining.Show everyone your cultural affinity with the Carmel Chat Height Fire Pit.Features. Sits 23 in. high. Base Color - Black. Burning Element - Copper Reflective Glass. Granite Top Finish - Black Mahogany. Size - 48 in. As one of the cultural capitals of California the city of Carmel inspires this artistically designed line of California Outdoor Concepts fire pit tables that make a simple yet bold statement for your backyard sanctuary. A tapered aluminum leg base sits under the shine of a polished granite top available in Sunset Gold Sea Green Black Mahogany or Pebble. Imagine yourself in a quaint beachside bistro as the soft breeze glances off your skin and draws you and your company closer to the glow of gentle flame shining.Show everyone your cultural affinity with the Carmel Chat Height Fire Pit.Features. Sits 23 in. high. Base Color - Brown. Burning Element - Copper Reflective Glass. Granite Top Finish - Capistrano Mosaic 48 in. Tile Top. Size - 48 in. California Outdoor Concepts 5010-BK-PG10-SUN-48 Carmel Chat Height Fire Pit-Black-Black Reflective Glass-Sunset Gold - 48 in. As one of the cultural capitals of California the city of Carmel inspires this artistically designed line of California Outdoor Concepts fire pit tables that make a simple yet bold statement for your backyard sanctuary. A tapered aluminum leg base sits under the shine of a polished granite top available in Sunset Gold Sea Green Black Mahogany or Pebble. Imagine yourself in a quaint beachside bistro as the soft breeze glances off your skin and draws you and your company closer to the glow of gentle flame shining.Show everyone your cultural affinity with the Carmel Chat Height Fire Pit.Features. Sits 23 in. high. Base Color - Black. Burning Element - Black Reflective Glass. Granite Top Finish - Sunset Gold . Size - 48 in. California Outdoor Concepts 5010-BK-PG10-BM-48 Carmel Chat Height Fire Pit-Black-Black Reflective Glass-Black Mahogany-48 in. As one of the cultural capitals of California the city of Carmel inspires this artistically designed line of California Outdoor Concepts fire pit tables that make a simple yet bold statement for your backyard sanctuary. A tapered aluminum leg base sits under the shine of a polished granite top available in Sunset Gold Sea Green Black Mahogany or Pebble. Imagine yourself in a quaint beachside bistro as the soft breeze glances off your skin and draws you and your company closer to the glow of gentle flame shining.Show everyone your cultural affinity with the Carmel Chat Height Fire Pit.Features. Sits 23 in. high. Base Color - Black. Burning Element - Black Reflective Glass. Granite Top Finish - Black Mahogany. Size - 48 in. As one of the cultural capitals of California the city of Carmel inspires this artistically designed line of California Outdoor Concepts fire pit tables that make a simple yet bold statement for your backyard sanctuary. A tapered aluminum leg base sits under the shine of a polished granite top available in Sunset Gold Sea Green Black Mahogany or Pebble. Imagine yourself in a quaint beachside bistro as the soft breeze glances off your skin and draws you and your company closer to the glow of gentle flame shining.Show everyone your cultural affinity with the Carmel Chat Height Fire Pit.Features. Sits 23 in. high. Base Color - Brown. Burning Element - Diamond White Glass. Granite Top Finish - Capistrano Mosaic 48 in. Tile Top. Size - 48 in. As one of the cultural capitals of California the city of Carmel inspires this artistically designed line of California Outdoor Concepts fire pit tables that make a simple yet bold statement for your backyard sanctuary. A tapered aluminum leg base sits under the shine of a polished granite top available in Sunset Gold Sea Green Black Mahogany or Pebble. Imagine yourself in a quaint beachside bistro as the soft breeze glances off your skin and draws you and your company closer to the glow of gentle flame shining.Show everyone your cultural affinity with the Carmel Chat Height Fire Pit.Features. Sits 23 in. high. Base Color - Black. Burning Element - Copper Reflective Glass. Granite Top Finish - Capistrano Mosaic 48 in. Tile Top. Size - 48 in. As one of the cultural capitals of California the city of Carmel inspires this artistically designed line of California Outdoor Concepts fire pit tables that make a simple yet bold statement for your backyard sanctuary. A tapered aluminum leg base sits under the shine of a polished granite top available in Sunset Gold Sea Green Black Mahogany or Pebble. Imagine yourself in a quaint beachside bistro as the soft breeze glances off your skin and draws you and your company closer to the glow of gentle flame shining.Show everyone your cultural affinity with the Carmel Chat Height Fire Pit.Features. Sits 23 in. high. Base Color - Black. Burning Element - Black Reflective Glass. Granite Top Finish - Capistrano Mosaic 48 in. Tile Top. Size - 48 in. 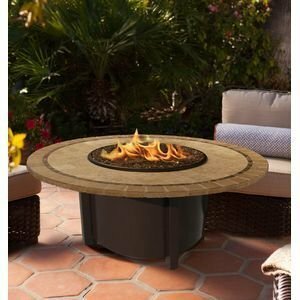 California Outdoor Concepts 5010-BR-PG1-SUN-42 Carmel Chat Height Fire Pit-Brown-Diamond White Glass-Sunset Gold - 42 in. As one of the cultural capitals of California the city of Carmel inspires this artistically designed line of California Outdoor Concepts fire pit tables that make a simple yet bold statement for your backyard sanctuary. A tapered aluminum leg base sits under the shine of a polished granite top available in Sunset Gold Sea Green Black Mahogany or Pebble. Imagine yourself in a quaint beachside bistro as the soft breeze glances off your skin and draws you and your company closer to the glow of gentle flame shining.Show everyone your cultural affinity with the Carmel Chat Height Fire Pit.Features. Sits 23 in. high. Base Color - Brown. Burning Element - Diamond White Glass. Granite Top Finish - Sunset Gold . Size - 42 in. California Outdoor Concepts 5010-BR-PG1-BM-42 Carmel Chat Height Fire Pit-Brown-Diamond White Glass-Black Mahogany - 42 in. As one of the cultural capitals of California the city of Carmel inspires this artistically designed line of California Outdoor Concepts fire pit tables that make a simple yet bold statement for your backyard sanctuary. A tapered aluminum leg base sits under the shine of a polished granite top available in Sunset Gold Sea Green Black Mahogany or Pebble. Imagine yourself in a quaint beachside bistro as the soft breeze glances off your skin and draws you and your company closer to the glow of gentle flame shining.Show everyone your cultural affinity with the Carmel Chat Height Fire Pit.Features. Sits 23 in. high. Base Color - Brown. Burning Element - Diamond White Glass. Granite Top Finish - Black Mahogany . Size - 42 in. Compare prices on California Outdoor Concepts Fire Pits at ShopPlanetUp.com – use promo codes and coupons for best offers and deals. We work hard to get you amazing deals and collect all available offers online and represent it in one place for the customers. Now our visitors can leverage benefits of big brands and heavy discounts available for that day and for famous brands.